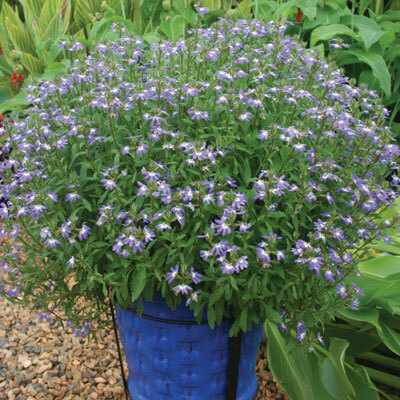 Scaevola, The Australian Fan flowers are well known for their long lasting flowering in native gardens, garden pots and hanging baskets. The flowers of Fandango Scaevola give splashes of bright blue, and white in such large numbers that they cover the bush. Fandango Scaevola, The Australian Fan flowers are among the easiest of plants to grow if a few basic rules are followed. Garden beds in sunny to semi-shaded positions are ideal, here you will be rewarded with masses of flower. Garden tubs and hanging baskets make a real show. The plants should be kept moist and never allowed to dry out too much if planted in a container. Make sure the garden bed, tub or basket is well prepared with compost rich media which will hold moisture but is free draining. Mulch at planting. In spreading the mulch keep it from being right up to the base of the bush to prevent rotting. Fandango Scaevola prefers an open draining garden media. In pots buy the best potting mix you can for best results. Compost and sharp sand can be incorporated in potting media if you need to lighten it up. In heavier garden soils build the bed up and dig in the amendments above. When plants need a light trim to keep shape you can prune at any time during the growing season. As Fandango Scaevola flower so much in spring, summer and autumn the best time for a major prune is early spring once the last frosts have gone. At this time add a fertilizer to boost the growth and flowering. One high in potash is ideal. Lots of special easy colour for your garden. Older spent flowers are dropped from the flower spike so they always look clean and fresh. Scaevola are members of the Goodenia family and are native to the tropics and subtropics, mainly Australia and the Pacific Islands. Scaevola aemula, one of the parents of these hybrids comes from southern and eastern Australia. Breeding work has been centred in Australia for the most part with Fandango Erect Early Blue coming from breeding done in New South Wales. Fandango White Wonder however was bred in Germany. Winter minimum temperatures of 5°-10° C are needed for Fandango Scaevola to survive. They will frost.